Looking at Article 16 of the UN Convention and what it means for safeguarding and preventing the abuse of people who may be vulnerable. What does article 16 of the UNCRPD say? 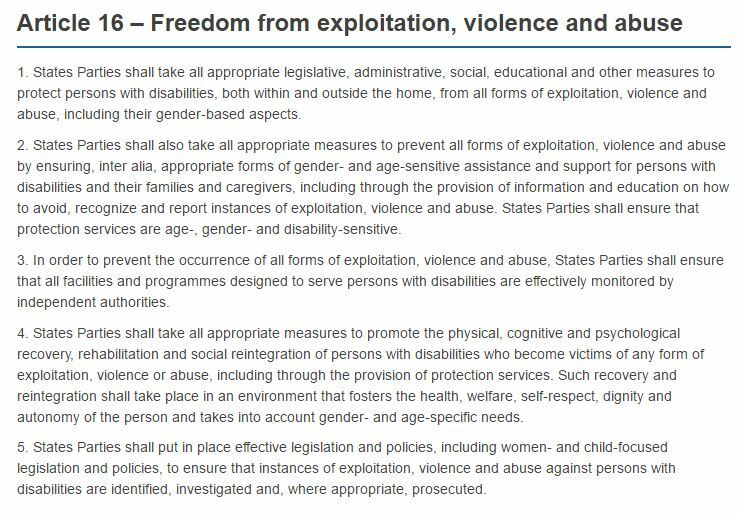 Article 16 then provides that persons with disabilities must be free from exploitation, violence and abuse and specifies the actions that State Parties must take to prevent abuse and to protect them from such abuses. Article 16 does not give a list of types of exploitation, violence or abuse but clearly, in using the term “all forms”, indicates that it encompasses a wide range of mental and physical violence, abuse to include sexual abuse, financial abuse, neglect and negligent treatment, and inhuman or degrading treatment. Exploitation includes both economic/financial exploitation, maltreatment and sexual exploitation. There is a particular emphasis on gender-based violence and abuse. As confirmed by both the research survey commissioned by the National Safeguarding Committee and the HSE Safeguarding Data Report 2016, there is a worrying level of exploitation, violence and abuse of adults who may be vulnerable in Ireland. For the purpose of this research, a vulnerable adult was stated to be someone who is limited in their ability to protect themselves from harm or exploitation, or to report such harm or exploitation. This includes an adult with dementia, mental health problems, physical disability or intellectual disability. The results of research, commissioned from Red C by the National Safeguarding Committee (NSC), showed widespread public concern that many vulnerable adults are open to, and are experiencing, physical, emotional, psychological and financial abuse as well as abuse based on age and disability (18% based on age and 16% based on disability). Half of Irish adults say they have experienced the abuse of vulnerable adults, either being abused themselves or seeing somebody close to them abused. There is a lack of clarity over where to report vulnerable adult maltreatment, particularly among the young. The purpose of the research survey was to prepare a baseline against which to measure progress in developing public awareness and changing attitudes and behaviour. 2016 is the first year of data collection on safeguarding concerns reported to the HSE Safeguarding and Protection Teams. The safeguarding concerns relate primarily to persons with a disability and/or over 65 years who are deemed vulnerable. Prior to 2015, the HSE elder abuse service did collect data in respect of persons over the age of 65 years, but there was no national system for collecting or recording data in respect of persons with a disability. There were 7,884 safeguarding concerns managed by the Safeguarding and Protection Teams in 2016. Of these, 4,788 came from a service setting and 3,093 from a community setting. The information given on the referral source of concerns indicate that voluntary agencies are the main source of referrals, followed by Public Health Nurses. The Report also indicates that safeguarding concerns from voluntary agencies are primarily within the disability sector (89%), whereas concerns that arise in the community, reported by Public Health Nurses, predominantly relate to older people residing in the community. It is also to be noted that the figures contained in the 2016 Report are limited to concerns reported to the HSE social care division and do not relate to acute hospitals, primary care or mental health services, nor indeed to abuse in the wider community of Irish Society. Paragraph 1 of Article 16 mandates State Parties to take appropriate legislative, administrative, social, educational and other measures to protect persons with disabilities from all forms of exploitation, violence and abuse, while Paragraph 2 obliges State Parties to take all appropriate measures to prevent such abuses. Paragraph 3 states that effective monitoring of programmes and facilities by independent authorities is required. Paragraph 5 calls for legislation and policies to ensure instances of such abuses are identified, investigated and prosecuted. So how has Ireland measured up to meeting our Article 16 obligations? Currently, the only policy document directly dealing with the issue of safeguarding is the HSE’s Policy Safeguarding Vulnerable Persons at Risk of Abuse. Although it purports to be a National Policy it is not – it is limited. The policy only applies to services directly provided under the HSE’s Social Care Directorate, which includes older people and people with a disability. The policy does not extend to other services such as mental health, or indeed to persons who are not in receipt of services but who endure abuse in their own home or community. In addition, there are no formal structures to enable the HSE Safeguarding and Protection Teams to liaise with An Garda Síochána or with regulators when issues of safeguarding arise. A further current deficit is the obligation of the State to ensure that all facilities and programmes designed to serve persons with disabilities are effectively monitored by independent authorities (Para 3). At present, both HIQA and the Mental Health Commission regulate certain services, but a recent HIQA Report points out that large numbers of people are being cared for in different care settings that are unregulated. These include domiciliary care, day services, personal assistance, home sharing, and respite and supported living arrangements. The latter two may in part come within the oversight of the regulator if they are co-located with a residential service. HIQA in this report also points out that if the principle objective of regulation is to protect and promote the rights of service users, then it is necessary to regulate service models that are currently unregulated. So what is required to comply with the State’s Article 16 obligations? It is necessary to have robust safeguarding legislation and for the State to acknowledge in such legislation its responsibility to prevent abuse and to protect those who are the subject of abuse from exploitation, violence and harm. The legislation should set out the responsibility for all services, to include financial and consumer services (not simply confined to health and social care), to have safeguarding policies and procedures in place. An Adult Safeguarding Bill 2017 was introduced in the Seanad in April and received all-party support. Although the detail of this Bill requires further development, it has included some of the essential requirements such as reporting requirements and the right of entry and inspection by ‘authorised’ persons. The Bill proposes the establishment of an Adult Safeguarding Authority and sets out the functions of the Authority to include the promotion of standards in the safety and quality of services provided to adults at risk, the promotion of education, training and public awareness and the requirement for the Authority to undertake investigations. If we are serious about promoting the wellbeing of persons with disabilities and respecting their dignity and autonomy, then it is essential that their protection against harm and abuse is put on a statutory footing. It is hoped that the development of adult safeguarding legislation, already before the Oireachtas, will be prioritised to ensure that Ireland does meet its international human rights obligations as set out in Article 16 of the UNCRPD. Patricia Rickard-Clarke is a solicitor and former Commissioner of the Law Reform Commission. She is Chair of the National Safeguarding Committee, Chair of the Third AGE’s National Advisory Council, SAGE, Support and Advocacy Service for Older People and Chair of the Law Society’s Mental Health and Capacity Task Force. She is a member of the Council of the Royal College of Physicians of Ireland, a member of the HSE’s National Assisted Decision-Making (Capacity) Act Steering Group and a member of the National Disability Authority’s Expert Group.